As the Paris shows marked the close of the AW15 fashion month, the Musée Galliera (the one true historical jewel in France’s fashion crown) opened its doors for the exhibition Jeanne Lanvin, the second designer retrospective since the prestigious museum’s long awaited reopening in 2014. Under the direction of the Principal Curator Olivier Saillard and the house’s current creative director Alber Elbaz, the show encompasses an astounding selection of Jeanne Lanvin’s creations, from the late 19th century until her death in 1946, in an exquisite display unlike any the museum has ever seen. Lying dormant in mirrored boxes, the dresses are like ‘Sleeping Beauties’ says Saillard, in an appropriately romanticised vision of the exhibition format that sees the Galliera’s ornate ceilings reflected back at the visitor amongst the delicate embroideries and precise, feminine cuts of Madame Lanvin’s creations. “Alber loved the idea of the dresses placed in the way a woman might do, laid out on her bed before getting dressed,” the curator explains. Olivier Saillard: There are more than 250 dresses by Jeanne Lanvin in the collection of the Musée Galliera, and so three and a half years ago, I realised we had the opportunity to create a truly substantial exhibition in homage to her work. There has never been a retrospective of her work anywhere in the world until today, which is strange considering Lanvin is the oldest fashion house still in operation. So at that point I went to see Alber and he was immediately interested, under the condition that we showed only the work of Jeanne herself, not his own, nor that of any other designers who worked for the house. As such the most recent piece is a coat towards the end of the exhibition that is dated 1946, the year of Jeanne’s death. I found that very honourable, and henceforth in working with Alber I discovered that he acted like a historian, but with the added sensitivity of a designer. Olivier Saillard: Alber loved the idea of creating ‘piano’ display cases. When you look back at the history of Lanvin there has always been an association with music, ever since the perfume ‘Arpege’ (the notes of a chord played in succession) right through to many very ‘symphonic’ designs. He liked the idea that, just as we find these dresses presented in the archive drawers, that we too can see them laid flat, floating, with the mirrors above that project their image skywards. There is something very symbolic in that. I love how it has become such a signature of this particular exhibition, as Alber wanted. Olivier Saillard: Exactly. Alber loves that idea that everything that would usually disappear on set, is shown. It’s the idea to present the ‘obverse and the reverse’ (the two sides of the coin), which was always a part of the work of Jeanne Lanvin. Could you explain the flow of the exhibition? Olivier Saillard: There is no chronological order to this show; we decided with Alber that it would be better to focus on themes, notably the obsessions present in Jeanne Lanvin’s work. There are chapters like ‘Black and Gold’, ‘Black’, ‘Ethnic Embroidery’, ‘Religious Influence’, ‘Blue’ which is a very important colour for Lanvin, and finally the ‘Exceptional Dresses’. These are all themes that return continuously throughout each era of Jeanne’s work, and which give a structure to the exhibition. At the same time, Alber loved the idea that one can walk through the show with almost no sense of order, and I prefer that too, much more than mapped out shows where visitors are obliged to queue. It’s more like in a botanical garden – you can wander from one flower to another, stopping where you like. Looking at the pieces themselves, do you find the fact that Jeanne Lanvin began as a milliner influenced the rest of her designs later on? Olivier Saillard: Yes indeed. And there are hats from each period scattered through the show, from the 1910s, 20s, 30s and later. They were very important to her work, just like children’s wear became too. It was one of the very first maisons to develop the idea of a ‘lifestyle’ brand. At Lanvin there were all the departments: womens, mens, childrens, interiors, perfume, all united already at the beginning of the 20th century. I think that millinery in particular continued to inform Jeanne’s taste for embroidery, and the practice of working in detail. Because when you make a hat, it is like working on a miniature, and at that time involved a lot of ruching, ribbons, and all types of embroidery. I think that certainly reflects in her dresses. Jeanne Lanvin had three embroidery ateliers in house, which was not the case with many designers, which allowed her to experiment a lot. Olivier Saillard: There are certainly some exceptional ones, special because they are some of the oldest, or because they belonged to interesting and celebrated women. For example, there is a silk satin brick-patterned coat from 1936, a signature piece of Jeanne Lanvin, which belonged to the Countess Greffulhe who inspired Marcel Proust’s character the Duchesse de Guermantes in À la recherche du temps perdu. We have her whole wardrobe. I also appreciate pieces that don’t seem like much from afar but up close represent an incredible attention to detail, like a pair of black 1930’s day dresses with intricate sleeve details – on one they are even removable. Then there is an embellished swimsuit designed in 1924 for a client who was going to the Villa Noailles at Hyères in the south of France – a garment not made for swimming, but to be worn poolside at that famous Mallet-Stevens house. What are some of the signatures of Jeanne Lanvin that really stand out for you now? Olivier Saillard: Looking at Jeanne Lanvin’s dresses, the bust and the body of a dress can often be quite sober, however the sleeves and shoulders are worked in a lot of detail. It really highlights the ‘column’ shape of her gowns. There are a lot of kimono influences, even though it seems like she did not travel a lot. 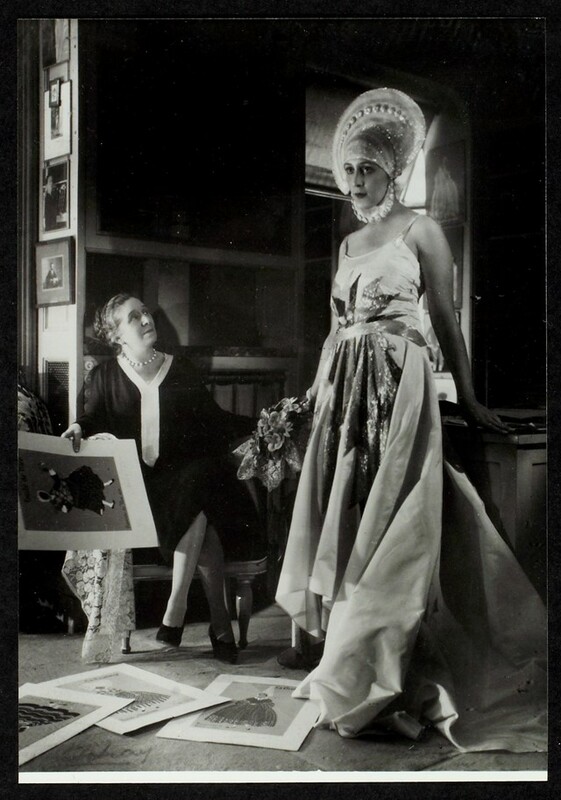 Jeanne was probably a lot more like Madeleine Vionnet, who kept to her ateliers – not a socialite like designers today. She was also incredibly inspired by monastic shapes when creating evening dresses; she designed with an incredible purity and sobriety through her career. We do not know if she was herself a great practitioner of religion, but it truly is surprising to see how she could take the form of a nun’s dress to make some of the most beautiful gowns of the 20s and 30s.